Now that both the K2 and Everest teams are nicely established at their respective base camps, they are beginning to make progress climbing the Hills. See this post for full background on the K2 and Everest expeditions and the history of winter attempts on the highest two mountains on Earth. Both teams are dealing with the same challenge: establish camps to support their summit push. Both will put in fixed lines to protect them from falls. Along the way, they will set up camps along the route. The highest camps will most likely be created on their summit push. Each camp will be stocked with tents, food, stoves, and fuel. Neither team is using supplemental oxygen thus significantly reducing the loads but also greatly increases the risk of frostbite. Establishing the low camps is critical but in the grand scheme not the biggest challenge. That will come when they break 7,000 meters or about Camp 3 for both the Everest and the K2 efforts. This is when high winds, heavy snow and avalanche conditions will come into play for their winter attempts. So the next couple of weeks should be calm by comparison to what we may see in mid to late February. The short-term issues will include climber health, a good acclimatization program and sufficient good weather to establish the route. The Polish team has established their BC and set up a solid camp complete with an Internet connection. 16 Jan update: I’m being told by their home team that high winds have hit K2 and the team may be stuck at base camp for a week or more. More details tomorrow. 17 Jan UPDATE: Janusz and Denis, according to info from the base camp, have reached about 5.900m, then return to the base. There will be no Camp I just Camp II at an altitude of 6,200. 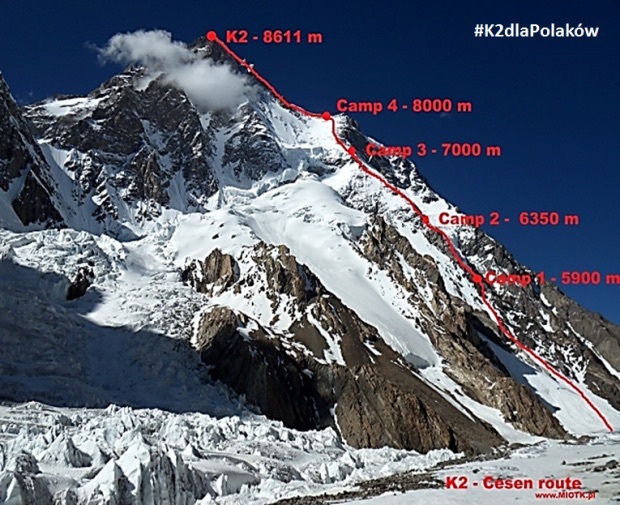 Part of their team has already gone to the base of K2 to scout out Camp 1 on the Česen Route aka Basque Route. They have very short days- starting at 8:30 with sunset at 15:30 – 7 hours total! High winds continue to be reported and we can expect to read this throughout their effort. In fact, in my opinion, that will be the only reason they don’t summit this year, short of a disaster. Alex Txikon and five Sherpas have fixed the ropes through the Khumbu Icefall. They have established Camp 1 at 6,050 meters in the Western Cwm. 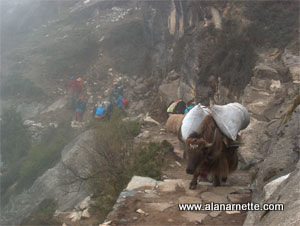 Today they did a day hike to Camp 2 just below the Lhotse Face. A small team of Pakistani climbers are attempting the first winter summit 7200 meter Masherbrum West Peak aka Masherbrum 2. Lead by Maaz Maqsood. Another big winter climb is by Simone Moro and Tamara Lunger on a very northern peak in Siberia, Pik Pobeda, 3003 meters, in the Chersky Range region. The highest peak outside the Himalaya is seeing the normal busy season. High winds have stalled quite a few attempts but one I’m following is a British team working on their 7 Summits. Chris and Ian Beale at age 70 have left for their summit bid. They report that Cecile Korg and team are attempting to take a Norwegian comedian to the summit via the False Polish Glacier Route! A Greek climber died on Aconcagua. 59 year-old Dimitri Constantinou was found near the summit in high winds and low visibility. Meanwhile, a valiant effort to break the speed record on the South Face of Aconcagua has come to an end due to winds and heavy snow. Ecuadorian Karl Egloff and Nicolas Miranda were out to beat the current time of 22 hours by Bruno Suzac, France in 2002 from Plaza Francia to the North Col as reported by Aconcagua Online.